This month the Joy Circle of do. Good Stitches was tasked with making two wonky star blocks which could contain any number of stars and had to use solids. Wow, that blue one looks wrinkly - I promise, I pressed it! 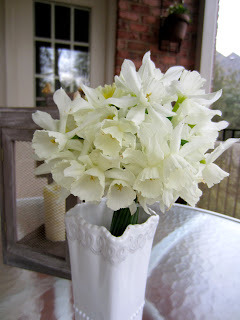 I think the heat is finishing off the daffodils, so I made one last bouquet for the porch this weekend. your blocks match your garden! love it!